The national motto of Indonesia is ‘Bhinneka Tunggal Ika’ - Unity In Diversity. It is the world’s largest Muslim majority country, but across its thousands of islands live more than 300 ethnic groups. Pancasila, the nation's founding philosophy, recited by school children every morning, proclaims unity in democracy, nationality and the belief in one god. However Indonesia's founding principles are being tested by a high profile blasphemy case. 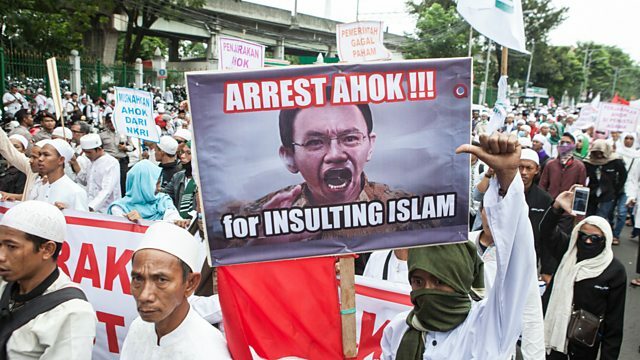 Jakarta’s first non-Muslim governor, Basuki “Ahok” Tjahaja Purnama, is the highest ranking official ever to be charged with insulting a religion. Whilst on trial, he is also running for re-election as governor. Before the blasphemy charges he was well ahead in the polls, but now it is possible he will lose in the February elections and may be jailed. With days remaining before Jakarta's elections Indonesian correspondent, Rebecca Henschke, investigates the use of Indonesia’s blasphemy laws alongside its reputation for religious tolerance. Galvanized by pressure from hardline groups, Rebecca witnesses crowds of tens of thousands gathered in Jakarta demanding Ahok to be jailed. Rebecca also meets Ahok's devoted supporters, committed to the campaign trail for his re-election. Ahok’s rise as a Chinese Christian to one of the country’s most prominent positions was seen as an example of Indonesia's commitment to religious tolerance. Now, many fear, a guilty verdict could cause irreversible damage.